Some Odd Girl is at it again, and I'm hopeful... ever so hopeful. Because *squeals* she's holding a GDT challenge again. If you are interested in putting your name in the ring, check out all the details here. 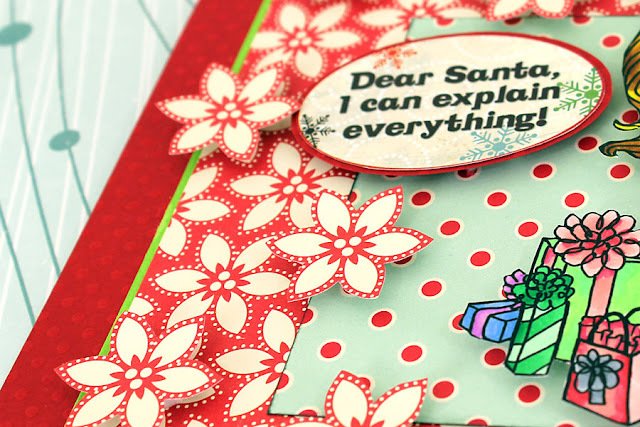 I love Kristy's stamps and digi's.. their ever so cute, I love to color them!! I really love the Deer Mae. be getting into her Christmas packages early. She was just rearranging underneath the tree is all. Pattern Paper is October Afternoon, Sentiment sticker is from Bo Bunny. Ah this is super cute! What a fabulous sentiment for this Odd Girl! I love the bright beautiful papers with your fantastic coloring!! Good luck in the Some Odd Girl guest dt call! Good luck on making the Odd Girl team Leah! This reminds me of my sister when we were young. She would open all of her presents and mine and then rewrap them. Then she would try to get me to let her tell me what I got but I didn't want to spoil the surprise. So one year she begged me to let her at least say what she got from our grandmother. I finally relented and she told me (can't remember what it was) and then she said "and you got the same thing but a different color"! Such a sneaky little brat she was :) Thanks for stopping by my blog with your sweet comments. This is adorable! Love the sentiment and the look on her face! :) Good luck on your DT entry. totally adorable! such a fun image with the sentiment you used! love how your flowers extend over the edge, brilliant design! best wishes for the SOG dt! That is so super cute!!! Love it! I think Ima work on this... I was a GDT back in April... or March... one of the two... would be fun to do again!!! Totally cute, Leah! I love it!! I love the card and the sentiment! You're right, she does look just a tad too innocent. My daughter has the same look down to perfection! Good luck with our GDT call! Your card is spectacular with so much dimension! love it! This is gorgeous! Love your coloring!